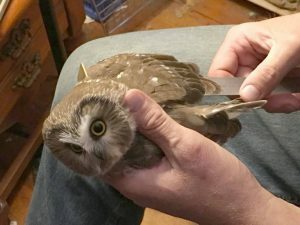 Nov 02, 2018 — The northern saw-whet owl population is being monitored and evaluated through a national effort known as Project Owlnet. Biologist Mark Manske leads a local endeavor to catch, evaluate, and tag the birds. The Northern saw-whet owl is among the smallest owls in North America. They weigh less than a baseball and fit in the palm of your hand. 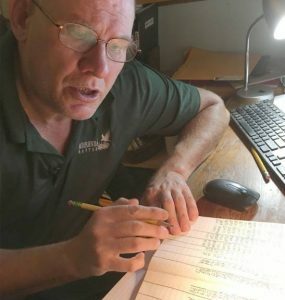 One man in Dickinson Center (in Franklin County) is part of an international effort to advance our understanding of the bird. To learn more about them you have to catch them. It’s a brisk fall afternoon just before sunset when I meet Mark Manske on the trail behind his house. He puts the dogs inside while we talk. Manske is a big man with a big smile. 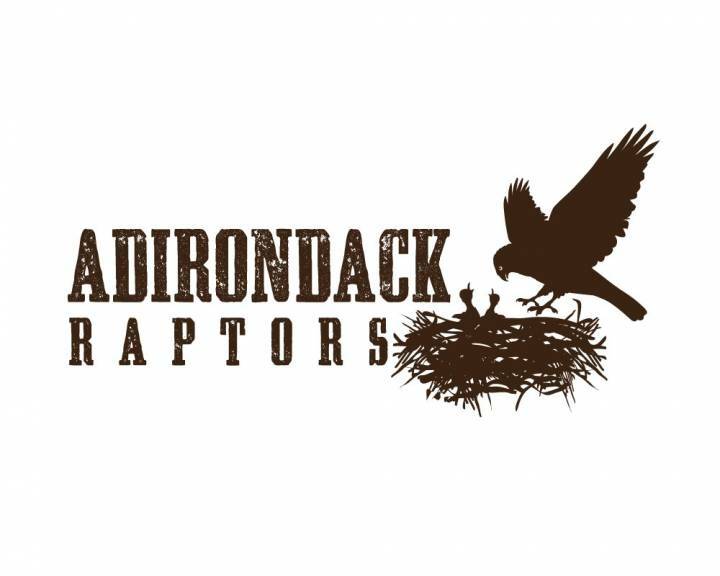 He’s a retired high school biology teacher, now he teaches at Paul Smith’s College and runs a company called Adirondack Raptors. You’ll see him showing off his birds at public events, doing raptor outreach. 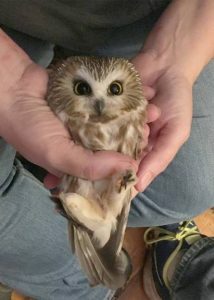 His love affair with one raptor in particular, the saw-whet owl, began one night when he was sitting on his porch tooting on his recorder. Tonight Manske and two volunteers: Tara Fuller and Jonas Borkholder will catch saw-whet owls. We hope. They’ll examine, band, and then release the birds. The bands each have a number. And each number will help tell each owl’s story. “I’m chompin’ at the bit I want to get rolling,” Manske said. Tonight looks good for catching, there’s a partial moon, a breeze, and it’s cool. This is all part of Project Owlnet, an international effort to better understand the Northern Saw-Whet Owl. 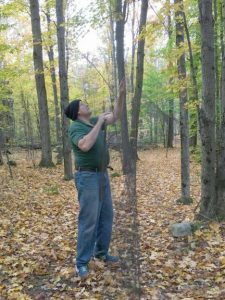 The birds aren’t endangered now, but researchers are documenting their health and migration patterns in case anything changes. A row of mist nets line the trail. Manske uses a cane to pull them into place. They’re made of fine soft fibers and they’ve got little pockets for catching owls. It takes more than a net, though, you need to attract the birds. Manske activates an audio lure that plays a saw-whet call. Manske: now this is pretty loud so I’m going to get it going here. So here’s the plan: we’ll wait in Manske’s house and every half hour two of us will go check the nets. A couple of hours pass. Nothing. We go out again. Manske: Oh, Did you hear that? That reeee? DD: Yeah, what was that? Manske: That’s a saw-whet, that’s a saw-whet, we got one around. But there’s nothing in the nets. Now back at the house. Coffee, conversation, repeat. And then the door swings open. Tara and Jonas burst through the door. Tara: We have success! We have an owl. The owl is in a white mesh bag, it wiggles around. Manske pulls the bird from the bag. Ok I need to take a moment and say here that these things are ridiculously cute. They don’t even look real. Little furry body, huge wide eyes. They look so cuddly. But they’re fighters. They’ll mess you up. Sharp beaks. Strong talons. Manske uses a gentle but firm hand. 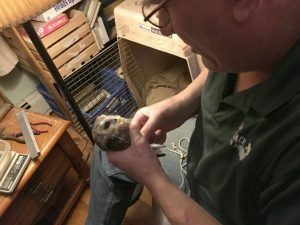 He weighs, measures, checks the owl’s eye color, body fat, age. All this stuff goes into a notebook and it will be entered in the database later. The owl makes an odd clacking noise. Tara: Oh it’s in the back of their throat, oh I didn’t realize that. Manske: I know, Yeah, I always thought it was their beak clacking. Manske places the bird back in the bag. Then he puts it on the dark porch to calm down before release. Time to check the nets again and band more owls. I follow Tara and Jonas out front to release two owls. 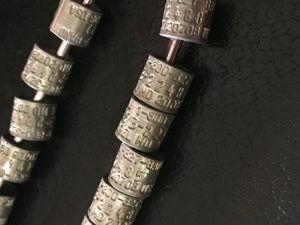 Each bird wears a shiny new numbered band. Tara gently pulls an owl out of her bag and before you know it, just like magic. Tara: Alright and ooh, that bird is also gone. DD: So, it almost looked like it floated out of your hand. Two owls disappear into the night. Thanks to Mark Manske now they’re individuals. They’ve got a history and data that will help researches better understand the saw-whet owl.